The former North Melbourne cable tramway engine house, which operated between 1890 and 1935 to power the cars of the North and West Melbourne lines, was one of eleven engine houses built by the Melbourne Tramways Trust for the central cable tramway network. The Melbourne cable tram system became one of the largest and most complex in the world. The entire network (except the local and separately built Northcote line) was constructed by the Trust between 1884 and 1891 and leased to the Melbourne Tramways & Omnibus Company until 1916. The trams were soon an integral and much-appreciated feature of Melbourne. The building, thought to have been designed by the Trust's architect Robert Gordon, was constructed by J Small. It is a finely detailed and crafted Italianate composition in polychrome brickwork and intricate sandstone dressings. The large circular louvre ventilator, incorporating spokes and central boss, high in the east facade, is a motif reminiscent of the large wheels of the cable-driving machinery previously housed within the building. The engine house originally featured a 45 metre chimney, of which a substantial portion of the base remains. The Abbotsford Street frontage contains the remaining front wall of the original outbuilding which housed reels and winding gear for handling used and replacement cables, and weighbridge equipment to monitor deliveries of fuel for the boilers, remains an important part of the complex. In 1935 the North Melbourne line was electrified and the West Melbourne line closed with buses replacing trams. 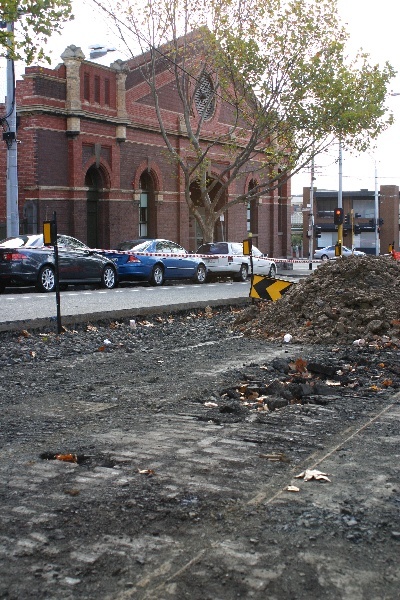 During roadworks in 2007 a 200 metre track formation of the West Melbourne line in Abbotsford Street was uncovered. This line travelled into Elizabeth Street in the city, via Abbotsford, Spencer and Lonsdale Streets. The typical track formation comprised a double set of tracks, each track containing a continuous central open slot which allowed the "grip" device of the "dummy" or leading vehicle to access the moving cable in a concrete tunnel below. The cable was carried on pulleys located regularly along the bottom of the tunnel and the road surface was paved with red gum blocks supported on a concrete slab. In 1893 the Melbourne Tramway & Omnibus Company installed separate dummy and car shunts outside the engine house so that West Melbourne line trams could shunt and return to the city without travelling through to the original terminus they shared at Flemington Bridge. This was one of a few changes to the original system made by the company to reduce operating costs during the sharp slump in patronage caused by the 1890s depression. The "dummy shunt" contained the continuous slot to allow passage of the dummy's grip from one track to the other whereas the separate "car shunt" had no slot, as the car was simply a trailer towed by the dummy. The uncovered tram track formation in Abbotsford Street also revealed the metal access covers for maintenance access to the tunnel pulleys, signal markings set within the road surface to advise the "gripman" of how to operate the grip at the track intersection outside the engine house (where three cables entered and left the building), and a section of stone paving where the vehicles shunted. The former North Melbourne cable tramway engine house and cable tram track formation are of historical, architectural, scientific (technical) and archaeological significance to the State of Victoria. The former North Melbourne cable tramway engine house is of historical significance as a substantially intact remnant of Melbourne's early tramways infrastructure, and the only engine house with remnants of its chimney and an outbuilding. Engine house chimneys were conspicuous features of Melbourne during the life of the cable tram system. Each tram route possessed its own engine house, usually located near the middle of the line. The substantial external intactness of this engine house provides a valuable symbol of an important phase in Melbourne's transport history and the development of the city, a phase which saw mechanical power supersede horse power on Melbourne's streets and allowed further development of the city's outer reaches. 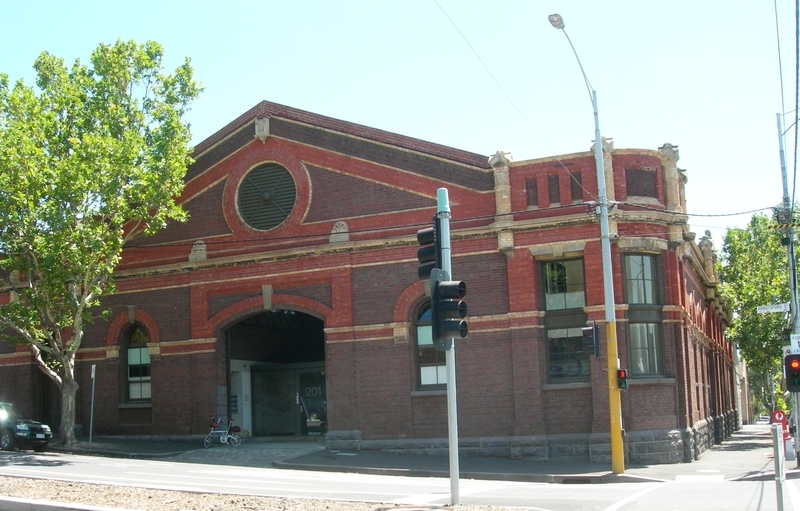 The former North Melbourne cable tramway engine house is of architectural significance as an excellent example of a 19th century industrial and transport infrastructure building. The fine architecture provides evidence of the pride with which Melbourne viewed its tramway system and of the importance of the system to the life of the city. The cable tram track formation is of historical significance for its association with the history of the cable tramway system in Melbourne. The dummy and car shunt is important as an extant example of the few minor alterations made to the original system by the Melbourne Tramway & Omnibus Company to ensure profitable operation of the tramways during changing social circumstances. The cable tram track formation is of scientific (technical) significance for its ability to assist in an understanding of the operation of the cable tramway system. It is typical of the entire Melbourne system designed by George Duncan (1852?-1930), the New Zealand born engineer who was appointed as engineer for the Melbourne Tramways Trust, the constructing authority for Melbourne's cable tram system. Duncan made many innovations and advances on the American cable tramway practice including the ability to construct lines around sharp curves with greater success than achieved elsewhere, and the design of an emergency slot brake. The cable tram track formation is of archaeological significance as the only known cable tram track to survive intact in Melbourne. The archaeological remains of the tram track infrastructure provide information about the operation of cable trams. The section of Abbotsford Street outside the former engine house has the potential to contain archaeological remains explaining the connection between the engine house and the underground cable tunnels and the track arrangement for the shunting operations. As Executive Director for the purpose of the Heritage Act 1995, I give notice under section 46 that the Victorian Heritage Register is amended by including the Heritage Register Number 0988 in the category described as Heritage Place and Archaeological Place. 1. All the buildings marked B1 and B2 on Diagram 988 held by the ExecutiveDirector. 2. 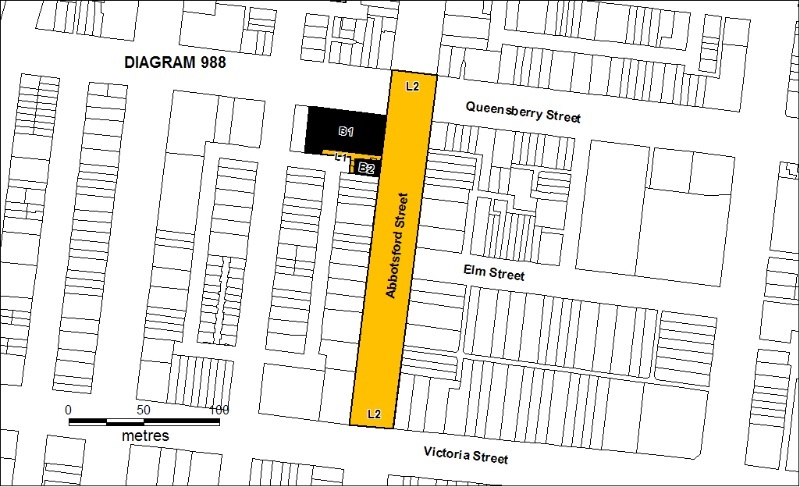 All the land marked L1 on Diagram 988 held by the Executive Director being all of Lots 3, 18 and 19 on plan of subdivision 542640 and all the land marked L2 being part of the Abbotsford Street road reserve. Between 1885 and 1891 seventeen cable tram lines were commissioned, totalling 43 miles of double track tramway. Eleven engine houses were built to power the underground cables, and seventeen car sheds were constructed to house more than 400 trams. At its peak (1923), the cable tram system was carrying more than 155 million passengers annually. Between 1925 and 1940 the Melbourne and Metropolitan Tramways Board, which took responsibility for the lines in 1919, converted the cable tram lines to either electric tramways or bus services. As part of the system of cable tramways planned for Melbourne in 1883, two routes served the municipality of Hotham (North Melbourne). Both routes began at Flinders Street and proceeded north along Elizabeth Street to Lonsdale Street, where they diverged. The main route continued further north along Elizabeth Street, then along Victoria, Errol, Queensberry and Abbotsford Streets and Flemington Road as far as Flemington Bride (Moonee Ponds Creek). The other route, known as the West Melbourne line, travelled along Lonsdale Street, Spencer Street and Abbotsford Street, until it met the main North Melbourne line at Queensberry Street. 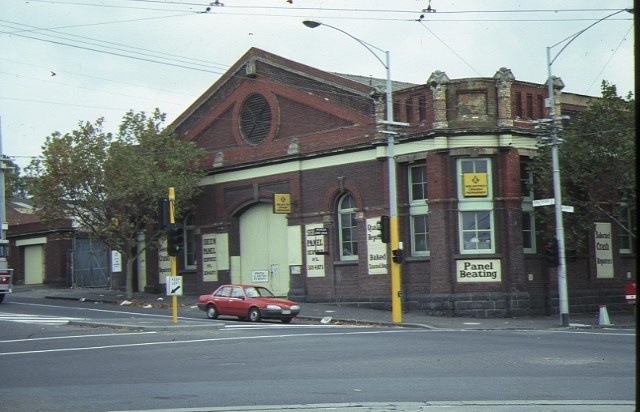 The engine house was closed on 20 July 1935 as a result of the electrification of the North Melbourne line and substitution of buses for the West Melbourne line. After closure, the M&MTB leased the building to a succession of motor body firms. For a time during 1942 it was occupied by the American army. This building was one of eleven engine houses built by the Melbourne Tramways Trust for the cable tramway network. Between 1890 and 1935 it provided power to the cars of the North and West Melbourne lines. This site is significant for containing the only known cable tram track to survive intact in Melbourne and the archaeological remains provide information about the operation of the cable tram system. General Conditions: 1. All exempted alterations are to be planned and carried out in a manner which prevents damage to the fabric of the registered place or object. General Conditions: 2. Should it become apparent during further inspection or the carrying out of works that original or previously hidden or inaccessible details of the place or object are revealed which relate to the significance of the place or object, then the exemption covering such works shall cease and Heritage Victoria shall be notified as soon as possible. Note: All archaeological places have the potential to contain significant sub-surface artefacts and other remains. In most cases it will be necessary to obtain approval from the Executive Director, Heritage Victoria before the undertaking any works that have a significant sub-surface component. General Conditions: 3. If there is a conservation policy and plan endorsed by the Executive Director, all works shall be in accordance with it. Note: The existence of a Conservation Management Plan or a Heritage Action Plan endorsed by the Executive Director, Heritage Victoria provides guidance for the management of the heritage values associated with the site. It may not be necessary to obtain a heritage permit for certain works specified in the management plan. General Conditions: 4. Nothing in this determination prevents the Executive Director from amending or rescinding all or any of the permit exemptions. General Conditions: 5. Nothing in this determination exempts owners or their agents from the responsibility to seek relevant planning or building permits from the responsible authorities where applicable. Regular Site Maintenance : The following site maintenance works are permit exempt under section 66 of the Heritage Act 1995: a) regular site maintenance provided the works do not involve the removal or destruction of any significant above-ground features or sub-surface archaeological artefacts or deposits; b) the maintenance of an item to retain its conditions or operation without the removal of or damage to the existing fabric or the introduction of new materials; c) cleaning including the removal of surface deposits, organic growths, or graffiti by the use of low pressure water and natural detergents and mild brushing and scrubbing; d) repairs, conservation and maintenance to plaques, memorials, roads and paths, fences and gates and drainage and irrigation. e) the replacement of existing services such as cabling, plumbing, wiring and fire services that uses existing routes, conduits or voids, and does not involve damage to or the removal of significant fabric. Note: Surface patina which has developed on the fabric may be an important part of the item's significance and if so needs to be preserved during maintenance and cleaning. Note: Any new materials used for repair must not exacerbate the decay of existing fabric due to chemical incompatibility, obscure existing fabric or limit access to existing fabric for future maintenance. Repair must maximise protection and retention of fabric and include the conservation of existing details or elements. Public Safety and Security : The following public safety and security activities are permit exempt under section 66 of the Heritage Act 1995, a) public safety and security activities provided the works do not involve the removal or destruction of any significant above-ground structures or sub-surface archaeological artefacts or deposits; b) the erection of temporary security fencing, scaffolding, hoardings or surveillance systems to prevent unauthorised access or secure public safety which will not adversely affect significant fabric of the place including archaeological features; c) development including emergency stabilisation necessary to secure safety where a site feature has been irreparably damaged or destabilised and represents a safety risk to its users or the public. Note: Urgent or emergency site works are to be undertaken by an appropriately qualified specialist such as a structural engineer, or other heritage professional. Signage and Site Interpretation : The following Signage and Site Interpretation activities are permit exempt under section 66 of the Heritage Act 1995, a) signage and site interpretation activities provided the works do not involve the removal or destruction of any significant above-ground structures or sub-surface archaeological artefacts or deposits; b) the erection of non-illuminated signage for the purpose of ensuring public safety or to assist in the interpretation of the heritage significance of the place or object and which will not adversely affect significant fabric including landscape or archaeological features of the place or obstruct significant views of and from heritage values or items; c) signage and site interpretation products must be located and be of a suitable size so as not to obscure or damage significant fabric of the place; d) signage and site interpretation products must be able to be later removed without causing damage to the significant fabric of the place; Note: The development of signage and site interpretation products must be consistent in the use of format, text, logos, themes and other display materials. Note: Where possible, the signage and interpretation material should be consistent with other schemes developed on similar or associated sites. It may be necessary to consult with land managers and other stakeholders concerning existing schemes and strategies for signage and site interpretation. Minor Works : Note: Any Minor Works that in the opinion of the Executive Director will not adversely affect the heritage significance of the place may be exempt from the permit requirements of the Heritage Act. A person proposing to undertake minor works may submit a proposal to the Executive Director. If the Executive Director is satisfied that the proposed works will not adversely affect the heritage values of the site, the applicant may be exempted from the requirement to obtain a heritage permit. If an applicant is uncertain whether a heritage permit is required, it is recommended that the permits co-ordinator be contacted. Management of trees in accordance with Australian Standard, Pruning of amenity trees AS4373. Installation, removal or replacement of hooks, nails and other devices for the hanging of mirrors, paintings and other wall mounted art. Demolition or removal of non-original stud/partition walls, suspended ceilings or non-original wall linings (including plasterboard, laminate and Masonite), bathroom partitions and tiling, sanitary fixtures and fittings, kitchen wall tiling and equipment, lights, built-in cupboards, cubicle partitions, computer and office fitout and the like. Installation of stud walls, which are removable. Refurbishment of existing bathrooms, toilets and kitchens including removal, installation or replacement of sanitary fixtures and associated piping, mirrors, wall and floor coverings. Removal of tiling or concrete slabs in wet areas provided there is no damage to or alteration of original structure or fabric. The former engine house is important for its substantial external intactness and any works impacting on its significance or structural integrity are subject to permit applications. The cultural heritage significance of the cable tram track formation lies in its archaeological, historical and scientific (technical) values. The archaeological remains of tram track infrastructure south of Queensberry Street to Victoria Street provide information about the operation of cable trams. The intersection of Queensberry Street and Abbotsford Street has the potential to contain archaeological remains relating to the tramway, including turning and shunting operations. Any works affecting the disturbance of below ground components of the site are subject to the Executive Director's approval.